Viruses are infectious particles about 100 times smaller than bacteria and can only be observed by electron microscopy. Virions, single virus particles, are 20–250 nanometers in diameter. In the past, viruses were classified by the type of nucleic acid they contained, DNA or RNA, and whether they had single- or double-stranded nucleic acid. Molecular analysis of viral replicative cycles is now more routinely used to classify viruses. The structure of the icosahedral cowpea mosaic virus: In the past, viruses were classified by the type of nucleic acid they contained, DNA or RNA, and whether they had single- or double-stranded nucleic acid. Viruses were first discovered after the development of a porcelain filter, called the Chamberland-Pasteur filter, which could remove all bacteria visible in the microscope from any liquid sample. In 1886, Adolph Meyer demonstrated that a disease of tobacco plants, tobacco mosaic disease, could be transferred from a diseased plant to a healthy one via liquid plant extracts. In 1892, Dmitri Ivanowski showed that this disease could be transmitted in this way even after the Chamberland-Pasteur filter had removed all viable bacteria from the extract. Still, it was many years before it was proven that these “filterable” infectious agents were not simply very small bacteria, but were a new type of tiny, disease-causing particle. Virions, single virus particles, are very small, about 20–250 nanometers in diameter. These individual virus particles are the infectious form of a virus outside the host cell. Unlike bacteria (which are about 100 times larger), we cannot see viruses with a light microscope, with the exception of some large virions of the poxvirus family. It was not until the development of the electron microscope in the late 1930s that scientists got their first good view of the structure of the tobacco mosaic virus (TMV) and other viruses. The surface structure of virions can be observed by both scanning and transmission electron microscopy, whereas the internal structures of the virus can only be observed in images from a transmission electron microscope. The use of these technologies has enabled the discovery of many viruses of all types of living organisms. They were initially grouped by shared morphology. Later, groups of viruses were classified by the type of nucleic acid they contained, DNA or RNA, and whether their nucleic acid was single- or double-stranded. More recently, molecular analysis of viral replicative cycles has further refined their classification. 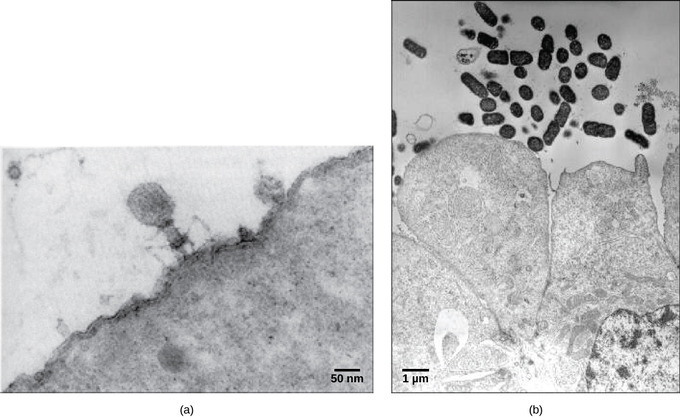 Examples of transmission electron micrographs of viruses: In these transmission electron micrographs, (a) a virus is dwarfed by the bacterial cell it infects, while (b) these E. coli cells are dwarfed by cultured colon cells. The evolution of viruses is speculative as they do not fossilize; biochemical and genetic information is used to create virus histories. Scientists agree that viruses don’t have a single common ancestor, but have yet to agree on a single hypothesis about virus origins. The devolution or the regressive hypothesis suggests that viruses evolved from free-living cells. The escapist or the progressive hypothesis suggests that viruses originated from RNA and DNA molecules that escaped from a host cell. The self-replicating hypothesis posits a system of self-replication that most probably involves evolution alongside the host cells. Although biologists have accumulated a significant amount of knowledge about how present-day viruses evolve, much less is known about how viruses originated in the first place. When exploring the evolutionary history of most organisms, scientists can look at fossil records and similar historic evidence. However, viruses do not fossilize, so researchers must conjecture by investigating how today’s viruses evolve and by using biochemical and genetic information to create speculative virus histories. While most findings agree that viruses don’t have a single common ancestor, scholars have yet to find one hypothesis about virus origins that is fully accepted in the field. One possible hypothesis, called devolution or the regressive hypothesis, proposes to explain the origin of viruses by suggesting that viruses evolved from free-living cells. However, many components of how this process might have occurred are a mystery. A second hypothesis (called escapist or the progressive hypothesis) accounts for viruses having either an RNA or a DNA genome and suggests that viruses originated from RNA and DNA molecules that escaped from a host cell. A third hypothesis posits a system of self-replication similar to that of other self-replicating molecules, probably evolving alongside the cells they rely on as hosts; studies of some plant pathogens support this hypothesis. 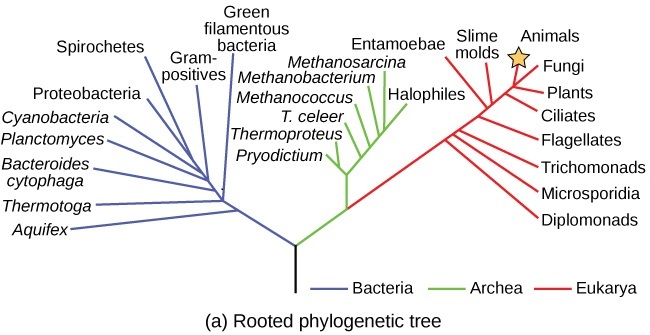 Common ancestor tree of life: This phylogenetic tree of the three domains of life (Bacteria, Archaea, and Eukarya) attempts to identify when various species diverged from a common ancestor. Finding a common ancestor for viruses has proven to be far more difficult, especially since they do not fossilize. As technology advances, scientists may develop and refine further hypotheses to explain the origin of viruses. The emerging field called virus molecular systematics attempts to do just that through comparisons of sequenced genetic material. These researchers hope to one day better understand the origin of viruses, a discovery that could lead to advances in the treatments for the ailments they produce. Viruses of all shapes and sizes consist of a nucleic acid core, an outer protein coating or capsid, and sometimes an outer envelope. Viruses are classified into four groups based on shape: filamentous, isometric (or icosahedral), enveloped, and head and tail. Many viruses attach to their host cells to facilitate penetration of the cell membrane, allowing their replication inside the cell. Non-enveloped viruses can be more resistant to changes in temperature, pH, and some disinfectants than are enveloped viruses. The virus core contains the small single- or double-stranded genome that encodes the proteins that the virus cannot get from the host cell. Viruses are acellular, meaning they are biological entities that do not have a cellular structure. Therefore, they lack most of the components of cells, such as organelles, ribosomes, and the plasma membrane. A virion consists of a nucleic acid core, an outer protein coating or capsid, and sometimes an outer envelope made of protein and phospholipid membranes derived from the host cell. The capsid is made up of protein subunits called capsomeres. Viruses may also contain additional proteins, such as enzymes. The most obvious difference between members of viral families is their morphology, which is quite diverse. An interesting feature of viral complexity is that host and virion complexity are uncorrelated. Some of the most intricate virion structures are observed in bacteriophages, viruses that infect the simplest living organisms: bacteria. Viruses come in many shapes and sizes, but these are consistent and distinct for each viral family. In general, the shapes of viruses are classified into four groups: filamentous, isometric (or icosahedral), enveloped, and head and tail. Filamentous viruses are long and cylindrical. Many plant viruses are filamentous, including TMV (tobacco mosaic virus). Isometric viruses have shapes that are roughly spherical, such as poliovirus or herpesviruses. Enveloped viruses have membranes surrounding capsids. Animal viruses, such as HIV, are frequently enveloped. Head and tail viruses infect bacteria. They have a head that is similar to icosahedral viruses and a tail shape like filamentous viruses. Many viruses use some sort of glycoprotein to attach to their host cells via molecules on the cell called viral receptors. For these viruses, attachment is a requirement for later penetration of the cell membrane, allowing them to complete their replication inside the cell. The receptors that viruses use are molecules that are normally found on cell surfaces and have their own physiological functions. Viruses have simply evolved to make use of these molecules for their own replication. 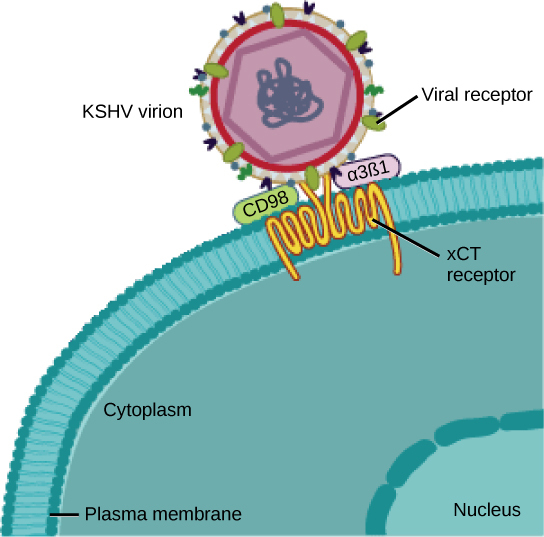 Example of a virus attaching to its host cell: The KSHV virus binds the xCT receptor on the surface of human cells. This attachment allows for later penetration of the cell membrane and replication inside the cell. Overall, the shape of the virion and the presence or absence of an envelope tell us little about what disease the virus may cause or what species it might infect, but they are still useful means to begin viral classification. Among the most complex virions known, the T4 bacteriophage, which infects the Escherichia coli bacterium, has a tail structure that the virus uses to attach to host cells and a head structure that houses its DNA. Adenovirus, a non-enveloped animal virus that causes respiratory illnesses in humans, uses glycoprotein spikes protruding from its capsomeres to attach to host cells. Non-enveloped viruses also include those that cause polio (poliovirus), plantar warts (papillomavirus), and hepatitis A (hepatitis A virus). 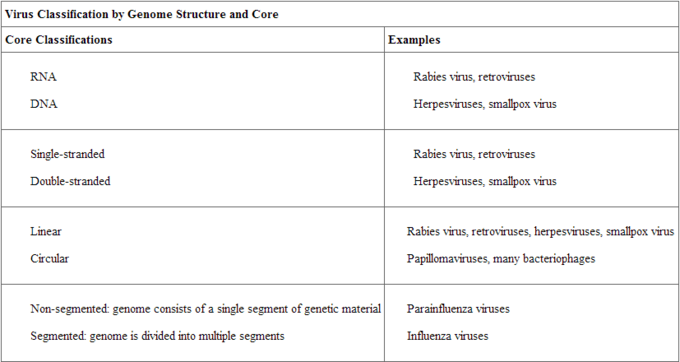 Examples of virus shapes: Viruses can be either complex in shape or relatively simple. 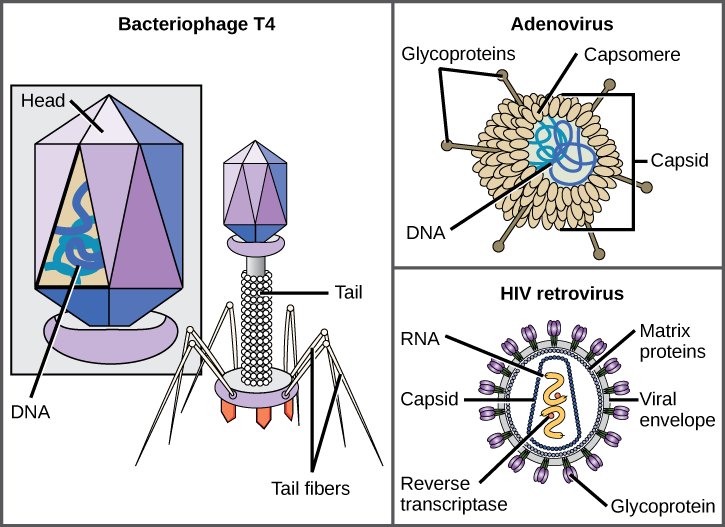 This figure shows three relatively-complex virions: the bacteriophage T4, with its DNA-containing head group and tail fibers that attach to host cells; adenovirus, which uses spikes from its capsid to bind to host cells; and HIV, which uses glycoproteins embedded in its envelope to bind to host cells. Enveloped virions like HIV consist of nucleic acid and capsid proteins surrounded by a phospholipid bilayer envelope and its associated proteins. Glycoproteins embedded in the viral envelope are used to attach to host cells. Other envelope proteins include the matrix proteins that stabilize the envelope and often play a role in the assembly of progeny virions. Chicken pox, influenza, and mumps are examples of diseases caused by viruses with envelopes. Because of the fragility of the envelope, non-enveloped viruses are more resistant to changes in temperature, pH, and some disinfectants than are enveloped viruses. Unlike nearly all living organisms that use DNA as their genetic material, viruses may use either DNA or RNA. The virus core contains the genome or total genetic content of the virus. Viral genomes tend to be small, containing only those genes that encode proteins that the virus cannot obtain from the host cell. This genetic material may be single- or double-stranded. It may also be linear or circular. While most viruses contain a single nucleic acid, others have genomes that have several, called segments. In DNA viruses, the viral DNA directs the host cell’s replication proteins to synthesize new copies of the viral genome and to transcribe and translate that genome into viral proteins. DNA viruses cause human diseases, such as chickenpox, hepatitis B, and some venereal diseases, like herpes and genital warts. RNA viruses contain only RNA as their genetic material. To replicate their genomes in the host cell, the RNA viruses encode enzymes that can replicate RNA into DNA, which cannot be done by the host cell. These RNA polymerase enzymes are more likely to make copying errors than DNA polymerases and, therefore, often make mistakes during transcription. For this reason, mutations in RNA viruses occur more frequently than in DNA viruses. This causes them to change and adapt more rapidly to their host. Human diseases caused by RNA viruses include hepatitis C, measles, and rabies. Viruses are classified by factors such as their core content, capsid structure, presence of outer envelope, and how mRNA is produced. The type of genetic material, either DNA or RNA, and whether its structure is single- or double-stranded, linear or circular, and segmented or non-segmented are factors for classification. Virus capsids can be classified as naked icosahedral, enveloped icosahedral, enveloped helical, naked helical, and complex. Virus can either have an envelope or not. A more recent system, the Baltimore classification scheme, groups viruses into seven classes according to how the mRNA is produced during the replicative cycle of the virus. messenger RNA: Messenger RNA (mRNA) is a molecule of RNA that encodes a chemical “blueprint” for a protein product. To understand the features shared among different groups of viruses, a classification scheme is necessary. However, most viruses are not thought to have evolved from a common ancestor, so the methods that scientists use to classify living things are not very useful. Biologists have used several classification systems in the past, based on the morphology and genetics of the different viruses. However, these earlier classification methods grouped viruses based on which features of the virus they were using to classify them. The most commonly-used classification method today is called the Baltimore classification scheme which is based on how messenger RNA (mRNA) is generated in each particular type of virus. The surface structure of virions can be observed by both scanning and transmission electron microscopy, whereas the internal structures of the virus can only be observed in images from a transmission electron microscope. Viruses are classified in several ways: by factors such as their core content, the structure of their capsids, and whether they have an outer envelope. Viruses may use either DNA or RNA as their genetic material. The virus core contains the genome or total genetic content of the virus. Viral genomes tend to be small, containing only those genes that encode proteins that the virus cannot obtain from the host cell. This genetic material may be single- or double-stranded. It may also be linear or circular. While most viruses contain a single nucleic acid, others have genomes that have several, which are called segments. The type of genetic material (DNA or RNA) and its structure (single- or double-stranded, linear or circular, and segmented or non-segmented) are used to classify the virus core structures. Virus classification by genome structure and core: The type of genetic material (DNA or RNA) and its structure (single- or double-stranded, linear or circular, and segmented or non-segmented) are used to classify the virus core structures. Viruses can also be classified by the design of their capsids. 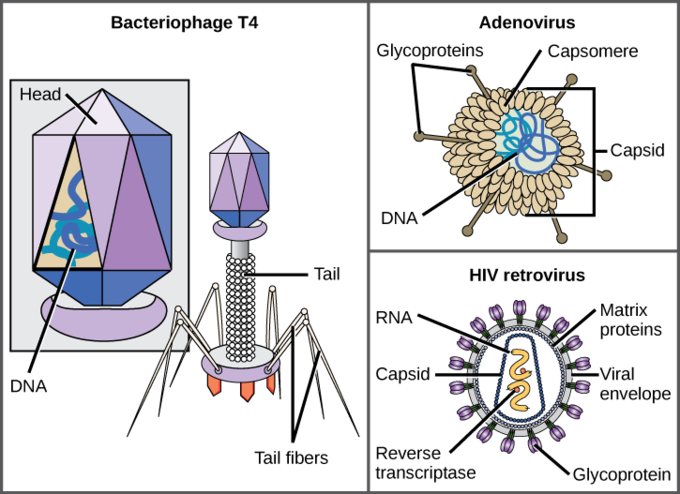 Isometric viruses have shapes that are roughly spherical, such as poliovirus or herpesviruses. Enveloped viruses have membranes surrounding capsids. Animal viruses, such as HIV, are frequently enveloped. Head and tail viruses infect bacteria and have a head that is similar to icosahedral viruses and a tail shape like filamentous viruses. Capsids are classified as naked icosahedral, enveloped icosahedral, enveloped helical, naked helical, and complex. For example, the tobacco mosaic virus has a naked helical capsid. 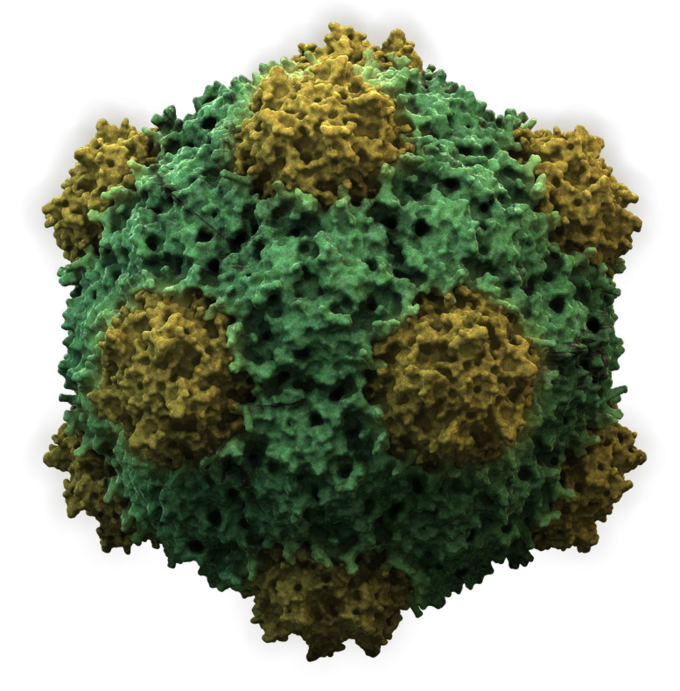 The adenovirus has an icosahedral capsid. Adenovirus classification: Adenovirus (left) is depicted with a double-stranded DNA genome enclosed in an icosahedral capsid that is 90–100 nm across. The virus, shown clustered in the micrograph (right), is transmitted orally and causes a variety of illnesses in vertebrates, including human eye and respiratory infections. Transmission electron micrograph of viruses: Transmission electron micrographs of various viruses show their structures. 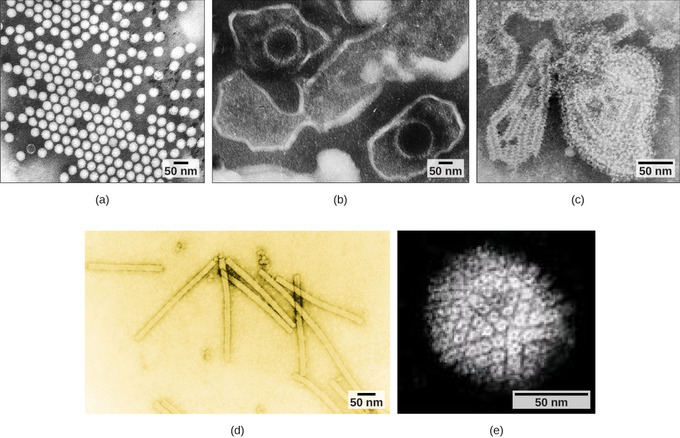 The capsid of the (a) polio virus is naked icosahedral; (b) the Epstein-Barr virus capsid is enveloped icosahedral; (c) the mumps virus capsid is an enveloped helix; (d) the tobacco mosaic virus capsid is naked helical; and (e) the herpesvirus capsid is complex. Virus classification by capsid structure: Viruses can also be classified by the design of their capsids which are classified as naked icosahedral, enveloped icosahedral, enveloped helical, naked helical, and complex. Example of viruses classified by caspid design: Viruses are classified based on their core genetic material and capsid design. 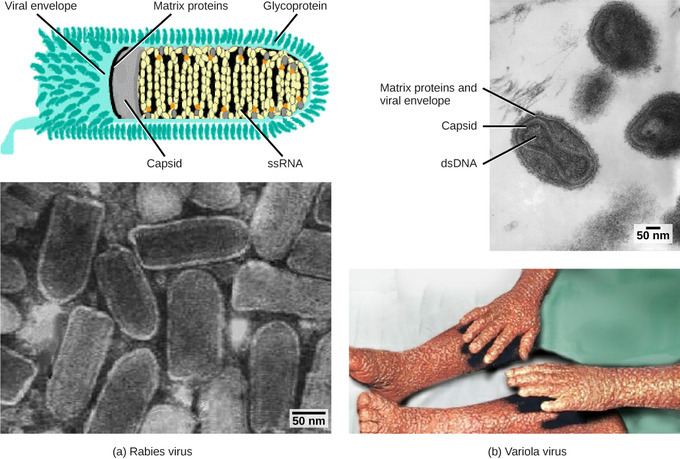 (a) Rabies virus has a single-stranded RNA (ssRNA) core and an enveloped helical capsid, whereas (b) variola virus, the causative agent of smallpox, has a double-stranded DNA (dsDNA) core and a complex capsid. The most commonly-used system of virus classification was developed by Nobel Prize-winning biologist David Baltimore in the early 1970s. In addition to the differences in morphology and genetics mentioned above, the Baltimore classification scheme groups viruses according to how the mRNA is produced during the replicative cycle of the virus. Viruses can contain double-stranded DNA (dsDNA), single-stranded DNA (ssDNA), double-stranded RNA (dsRNA), single-stranded RNA with a positive polarity (ssRNA), ssRNA with a negative polarity, diploid (two copies) ssRNA, and partial dsDNA genomes. Positive polarity means that the genomic RNA can serve directly as mRNA and a negative polarity means that their sequence is complementary to the mRNA. Baltimore classification: The Baltimore classification scheme, the most commonly used, was developed by Nobel Prize-winning biologist David Baltimore in the early 1970s. The scheme groups viruses according to how the mRNA is produced during the replicative cycle of the virus, in addition to the differences in morphology and genetics.